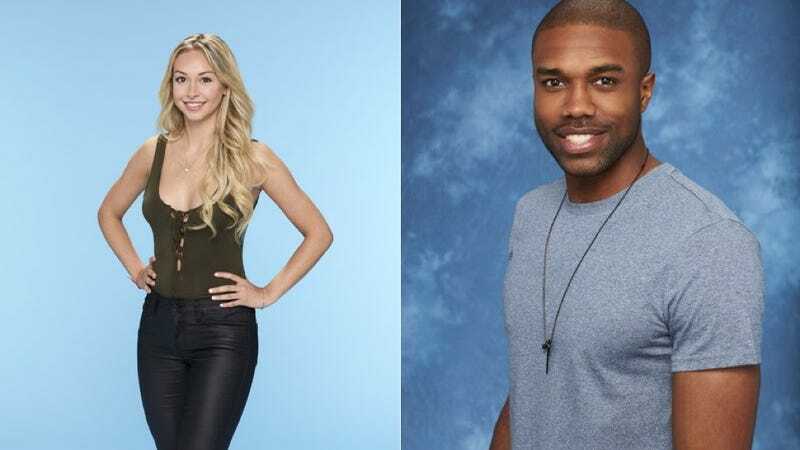 Corinne Olympios and DeMario Jackson, the two Bachelor in Paradise contestants involved in a sexual encounter on set that prompted a producer to file a complaint over alleged misconduct, have each released their first comments about the matter that have not come merely from “sources” close to them. On Tuesday evening, TMZ spoke to Jackson—or attempted to—as he was out in Los Angeles. Though he responded “no comment” to most of their questions, Jackson suggested that things were “all good” with Olympios. I am victim and have spent the last week trying to make sense of what happened on June 4. Although I have little memory of that night, something bad obviously took place, which I understand is why production on the show has now been suspended and a producer on the show has filed a complaint against the production. As a woman, this is my worst nightmare and it has now become my reality. As I pursue the details and facts surrounding that night and the immediate days after, I have retained a group of professionals to ensure that what happened on June 4 comes to light and I can continue my life, including hiring an attorney to obtain justice and seeking therapy to begin dealing with the physical and emotional trauma stemming from that evening. TMZ also reports that the legal counsel she’s referring to is Marty Singer, the famed Hollywood lawyer; BuzzFeed adds that her new publicist is the also well-known Stan Rosenfield. These statements come after several days of endlessly evolving commentary from those connected to the franchise, both anonymously and on the record, as well as a great variety of reports about the degree to which Olympios and Jackson were intoxicated, the names of the producer(s) who appear to have blown the whistle on the incident, and whether or not said producers were there to witness what happened or have seen the footage of it. Some of those who have offered their insights and speculation include: former Bachelor Ben Higgins, former Bachelor and Bachelor in Paradise contestant Ashley Iaconetti, franchise host Chris Harrison, as well the (brief) castmembers for this season of the show, including Derek Peth, Iggy Rodriguez, Raven Gates, Wells Adams, Taylor Nolan and Jasmine Goode.